Fibromyalgia, a disease which affects 0.5-5% population, more common in women with female to male ratio 9:1, is highly under-diagnosed condition. This disease has genetic predisposition, which means if your first degree relatives are suffering from this disease then there are eight fold greater chances of you having this disease. Other environmental factors which can cause or exaggerate the symptoms of fibromyalgia can be body trauma or injury, hepatitis infection, viral infection( Epstein virus), lyme disease, emotional stress, sensitive nature or autoimmune diseases. The main features of fibromyalgia include widespread pain with multiple tender points, excessive fatigue, irritability, may have headache or joint pains, frequent tummy upset. So if one has features of persistent & repeated widespread musculoskeletal pain and tenderness then one should think of being suffering from fibromyalgia. Fibromyalgia syndrome spoils your quality of life, work performance becomes less & there occurs feeling of isolation due to withdrawal from social activities. This can lead to distressing physical, social & pshychological effects. In these patients sometimes even touch can be painful (called as mechanical allodynia). They also suffer from sleep disturbance which can make their moods depressive and behavior erratic. Since this disease is chronic in nature, it needs regular touch with your treating physician. The treatment includes medicines, regular exercises, modification of life style, yoga, physical therapies. The regular exercises should be done with advise of pain physician, as overdoing the exercises themselves can cause exaggeration of symptoms. That is why some people get worse with gymming. 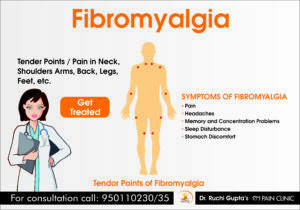 The people suffering from fibromyalgia need to follow low intensity activities like walking, dancing, cycling, yoga etc. These activities need to be increased or paced in very gradual way. Life style modification will involve cognative behavior therapies if expert help available in your area otherwise regulating your life, improving your diet & regularizing meal plans, taking less stressful jobs if possible can help you. Meditation helps in reducing mental stress.